Yup! This is giveaway number TWO for DAY THREE of the Just Jingle Giveaway Week! WOW, this is so much fun! And HUGE kudos to you guys for leaving interesting comments along the way, just as I asked! You are making it even MORE fun! LOVE THAT! Today's sponsor is none other than the FABULOUS Lil' Inker Designs!!! I love Lil' Inker dies and stamps and I am so excited that they are a part of my giveaway week! Lil' Inker Designs is offering a $25 Gift Certificate to one lucky winner! WHAT?! Yup. That's pretty darned awesome! Here is a card I created awhile ago using some great Lil' Inker Designs goodies! To find more Lil' Inker goodness, check them out in the links below! Also, be sure to check over on my Just Jingle Facebook page for a second chance to enter to win this great prize! One winner will be chosen from all comments on this blog post and the Facebook post combined. One entry per location per person. Don't forget to enter the giveaways posted earlier this week, as well! Two a day!!! All will remain open for a full week! I am a huge fan of Lil' Inker Designs! LOVE these stars especially! Awesome card! The stars are very pretty. Having them raised off the background gives some depth to the card. Your card is fabulous, love all the depth and dimension for reals:-)!!!! I love the offset black stars and all the great stamping on the stars themselves. The sentiment is spot on perfectly fun! Thanks so much for sharing! FABULOUS card! LOVE the dimension! Lil' Inker's is one of my favorite companies - their stitched dies never leave my desk! Placed my first order with lil inkers about 2 weeks ago. Love! 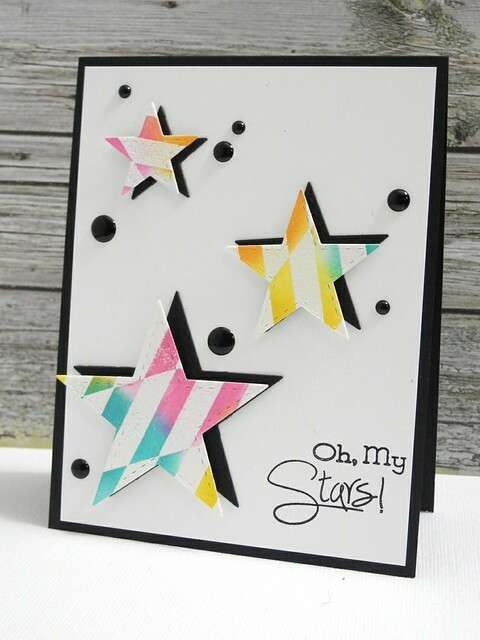 oh I love Lil'inker Designs.. there dies are always so awesome.. your card is amazing.. i love the stitched stars..
Love your colorful star card Jingle! The neon colors and the "shifting" of the stars really bring out the dark contrast! You sure are the queen of creative ideas. Such a fun card...love those colourful stars. I am really in love with LID's stitched dies! Oh I do love me some LID.....I need those stitched alphas. And LOVE the stars on your card! A set of star dies is on my crafting to-get list! Lil' Inkers has so many cute items! I won't have any trouble spending that $25! Thanks! Say WHAAAAT?! !...Love me some Lil' Inker Designs! AWESOME card! Great card. Is there any chance you will show us how you achieved the pattern on the stars. They are so eye catching. A jingle giveaway week, is like Christmas in the Summer, what could be better than that? I love dies, all dies, all companies, but I really really love the stitched dies at lil inkers and I have so many more from them on my wish list. I know, I am a "die ho", and hoarding sickness with them, but I NEED more, lol. Thanks for the chance to win. love this! That awesome pattern and the fun mix of neon colors....awesomeness! I have to say I wasn't too familiar with them, but a stroll through the shop had me pining and pinning : ). WHOOP WHOOP! WHOOP! I am swooning over this card you made....WOWZA! I also will shyly admit I have no product by them...but I opened their store in another window and I am going to go shop because I have wanted some stuff for a while now! THANKS chica!!! LOVE LOVE LOVE Lil' Inker, especially their dies! TFS!!!! Wonderful card. I like how the colorful stars are offset. That's an eye catching design, love the striped stars and all the dimension! I love the pattern you created on your stars and the shadows you created work perfectly. Lil'inkers makes such amazing products to work with. Hi Jingle!!! Thank you so much for the opportunity to connect Lil' Inker Designs and your fabulous readers and fans!!!! I'm delighted to be sponsoring your successes and thank you SO MUCH to your fans who have stopped by our FaceBook page today to say hello! That's so awesome! Anywhoo, you ROCK and thanks again! Oh my stars is right, this card rocks! I love Lil Inker Dies. I just can't stop using them. I am always trying to find a way to use one of the stitched dies in everything I make. Are those enamel dots scattered amongst the stars? Makes me think of tiny planets and great big, shiny stars. Beautiful! Lil' inker - with a name like that, they've got to be good! Sadly, I have no Lil' Inker Designs stamps, but hey - you could fix that! Problem solved. Love everything about Lil Inker! Oh fun, love their work, what a great round up of giveaways. I love Lil' Inkers stitched dies! Anytime I see a project with stitched detail I always think of them! Little by little, I fell in love with Lil' Inkers Designs, especially their oh, so perfect stitched dies!! Your card is just so fab with the striped stars! A $25 prize would knock a few things off of my Lil'Inkers MUST HAVE list - I need all of the help I can get to add to my collection without my husband noticing . . . Love those stars - and they aren't on my list yet!! Fun fact we have two foxes staying next to us on vacation.... Hmmm what does the fox say? I would be so starry eyed if I win!! I love the stars and your card! Star light, star bright, best card I've seen tonight!! Love Lil Inker and I think they can put a stitched edge on anything. The black undertones remind me of the vivid colors right before a really big storm hits. Luckily no storm coming with your card, just the rainbow. Love this card and those black enamel dots are well...awesome. Love your fun star card... Lil' Inkers is a favorite! Awesome dies, and great quality! I NEED some more of them! Did you know that the duffel bag is named for the Belgian town of Duffel where the fabric for the bag was manufactured? Love your card, by the way! Love your starry card, brilliant way to layout the stars. THIS card is FANtastic! Love the colors and design! Yay for Lil' inker designs! Their products are so much fun! Oh my, a stamp company I haven't heard of! I can't wait to check out their site! Love the card! I just love Lil Inker's dies with the built-in stitches, like your stars! And I love the way you built in a shadow behind yours on your card! Genius! LOVE your rainbow stars with their stitched edges and shadows - GREAT sentiment too!!! THANK YOU for the chance to win some CRAFTY AWESOMENESS!!! That is an absolutely star struck card!!! very stunning!! what an awesome fun card full of color and texture...love those stars!!! WOW, I just discovered your blog this week and have found out about 2 companies that I had not heard of so I am grateful that you are introducing me to different stamps. This card is really cool. Thanks for chance to win! I had 2 beers tonight - Summer Shandy is my friend. Cute, cute card. I'm always on the look out for cute ideas to use my dies. You sure have a good eye for matching patterned papers to dies...Very cool effect, and I'm always a sucker for stitched die cuts!! Jumping up and down!!!! Squealing!!! Ooooohing and Awwwwwwing!!! Standing on my head to view your fab card upside down! Nothing boring at all!!!! :) Because I love rainbow colours and I love stars, this is a standout for me! Yet another company I haven't tried yet...you enabler, you. Oh, lovin' the rainbow goodness here as well! love the offset of the stamps and the rainbow stripes! great design! Wow, this card is making me think of My Little Pony...and that is either a good thing or a bad thing, depending on whether I got enough sleep last night or not! Rainbows and stars on their own are lots of fun, but I especially like the black enamel dots you added. Thanks for the chance to win all these giveaways this week....you've given me a reason to wake up every day! Your card is stunning. I love the simplicity of it and yet, there is so much to look at. This is one of those cards I have pinned so that I can find inspiration when I need some. love the black and white with these colors! Did you know Clifford the Big Red Dog was originally going to be named Tiny? I like Clifford better. I got distracted browsing Lil Inker Designs website after seeing this card so I would say your design is a success!! Love the mix of rainbow colors and lots of white space in your card!! Oh my stars!!! A sentiment that fits right in here in South Carolina...along with sweet tea, southern accents, and humidity!! Looooooove Lil inkers!! And your card rocks!! Oh my stars is right. I LOVE how you off set your stars. Great idea. Thanks so much for the chance to bring home some yummy goodies. Ooh, those stars are fabulous and just pop right off that card! True story: I once sent my younger brother a Christmas card with a glittered snowflake embellishment popped up on it and he tried to eat it, thought it was candy. He will NEVER live that one down! I can just hear Laura Pryor saying that sentiment, in her fabby Boston accent... Love the shadowed effect you created with the "stahs". Did you use those neon ink pads to stamp/colour them? Oh my stars, my most beautiful stars! That's what came to mind when I saw your gorgeous card. Love the offset stars with the black background. Your inking is fabulous. My wish list for Lil' Inkers keeps growing and growing as I peruse blogs like yours that make me HAPPY. TFS, Jingle! have the wish I wish tonight. Oh my stars!! Love me some Lil Inker!!! This is an awesome card!!! Great project Jingle. I also love Lil' Inker Designs dies but still saving some to get some of those. I specially love the stitched borders they incoporate in the dies. I got one of their stamps set called It's Today Right? So cute and whimsical just the way I like. OH I LOVE stars!!!! I love the water color and embossing combo on your stars. AND I love the black background - such an easy way to pop an image!!!! My new favorite Jingle card! I love the embossing and layered diecuts. Awesomeness! Wishing up a star...or two that I win! I just love how the black and white make the stars pop! Oh my! Jingle - what a shining card! I love the Lil Inkers stitched die sets! I've got the squares and circles and have used them over and over since getting them! Can't wait to add more to my collection, thank you for another great giveaway! Long time Little Inker Designs fan here!!! There stuff is adorable!!!! Thanks for the chance to win! This party is just getting.... AWESOME-R with this card! Super star! love how you offset the diecuts and the negatives! Fab-U-LOUS! I love those stars and you really made them shine! Especially like the black dot accents - a small detail that really plays up the "shadow" stars. If I win, I will grin! Eeeeeeek! This is fabulous!!! These stars are amazing! It's COMING!!!!! Just Jingle GIVEAWAY WEEK! Tape: Turns out, that stuff is useful! Flying High With An Awesome Die! Watercolor, oh, and sketching and stuff, too! Simon Says Stamp Mother's Day Sale! How About a Bit of Sunshine? Just Jingle is All Decked Out Today! This Card Could Get Me In Treble! Hello, Beautiful... stamps. Beautiful stamps!